To determine the relative validity of the Malnutrition Screening Tool (MST) compared with a full nutrition assessment by the scored Patient Generated-Subjective Global Assessment (PG-SGA) and to assess MST inter-rater reliability in patients receiving chemotherapy. 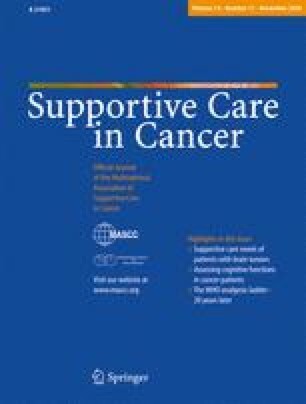 An observational, cross-sectional study was conducted at an Australian public hospital in 50 oncology outpatients receiving chemotherapy. Inter-rater reliability was assessed in a subsample of 20 patients. According to PG-SGA global rating, the prevalence of malnutrition was 26%. The MST was a strong predictor of nutritional risk relative to the PG-SGA (100% sensitivity, 92% specificity, 0.8 positive predictive value, 1.0 negative predictive value). MST inter-rater reliability was acceptable with agreement by administration staff/nursing staff/patient and the dietitian in 18/20 cases (kappa=0.83; p0.001). The MST has acceptable relative validity, inter-rater reliability, sensitivity, and specificity to identify chemotherapy outpatients at risk of malnutrition and, hence, is an acceptable nutrition screening tool in this patient population. EI was the main author of the manuscript, supervised the project and assisted in statistical analysis and interpretation. GC initiated the study, supervised the project and assisted in writing the manuscript. LD, EK, and BK initiated the study and assisted with writing the manuscript. We would like to thank Silvia Hui, Kanita Kunaratnam, Kellie Wright, and Lydia Yuen for assisting with data collection as part of the requirements for the Master of Nutrition and Dietetics.